I don’t think Winemaker B (Brandon Lapides) will soon forget the first day of harvest this year. 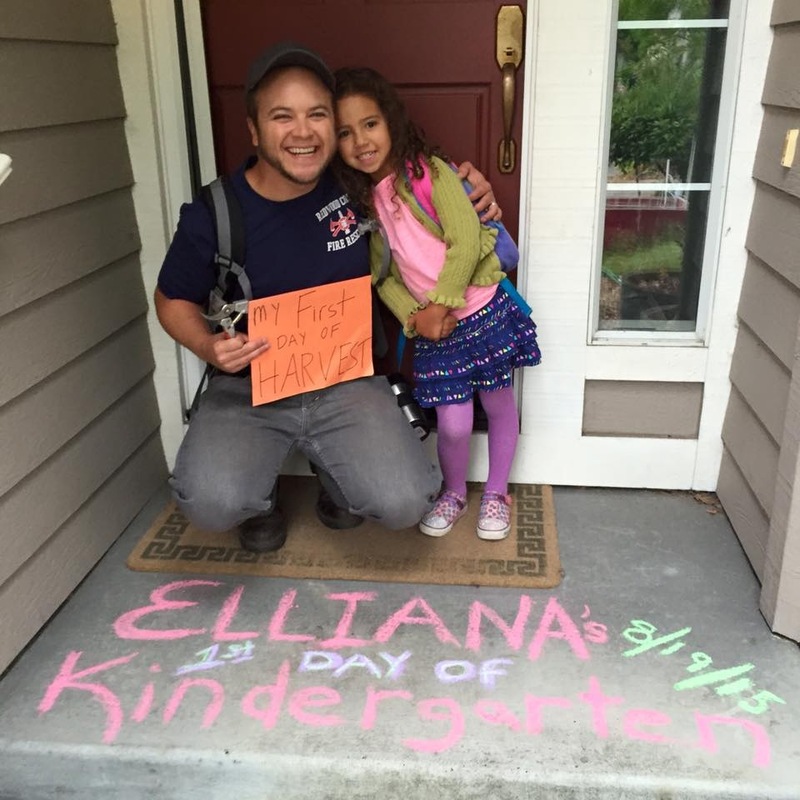 In one of those interesting coincidences, the first day of harvest for Armida Winery (Pinto Gris brought in) was also the first day of kindergarten for his first-born, Winemaker-in-Waiting Elliana. Wednesday August 19th was a big day for everyone in the family. 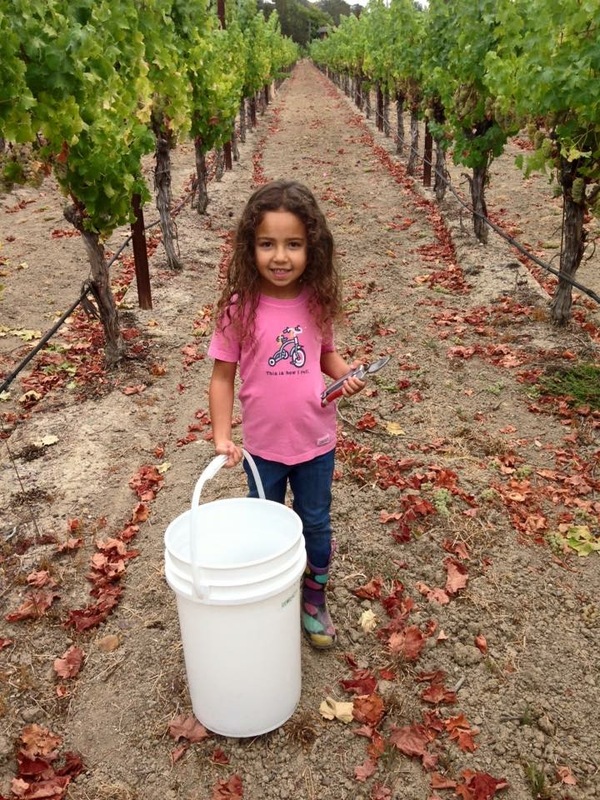 Winemaker B and WiW Elli were out in the vineyards yesterday morning checking sugar levels. The first Zinfandel was supposed to come in today; likely Sauvignon Blanc later in the week. Winemaker B is cautiously optimistic about harvest this year. Yes, harvest is early, but the growing season started early, so the grapes got the right amount of hang time. Couple that with no sustained heat spikes, and the grape quality should be good this year. Balancing that is a reduced yield, due primarily to the drought. Still trying to figure out how much the drop in volume will be. So cautious optimism for now, but we’ll check in with him in September to see how the harvest is shaping up. This entry was posted in winemaking and tagged 2015 harvest, Armida Winery, Brandon Lapides, Winemaker B on August 24, 2015 by vvblogman. 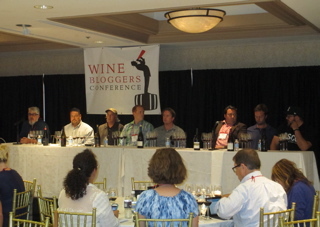 At the Wine Bloggers Conference last year, one of the sessions was on Ballard Canyon AVA Syrahs. 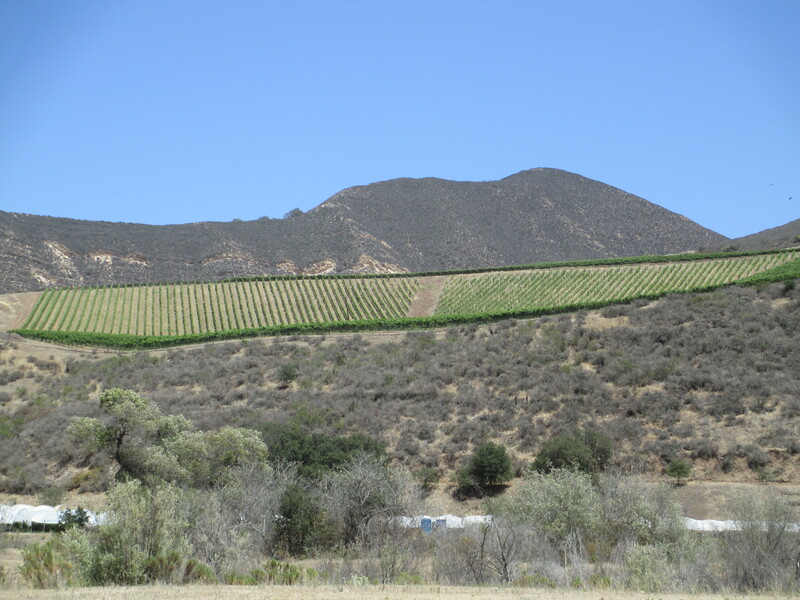 Ballard Canyon is one of the newest AVAs in the Santa Ynez Valley, and has made its reputation based on the Syrahs and other Rhône varietals that are typically grown there. I tried Syrahs from 7 different wineries in that session, with typically two vintages per winery. One winemaker on the panel described Syrah by comparing the wines from this varietal to the dancing hippos from the movie Fantasia, but substituting the dangerous animals of the Nile for the cute animated hippos. (The music to that scene is Dance of the Hours, by Amilcare Ponchielli.) Not a bad analogy: Syrahs can be big and bold and graceful, and dangerous to novice winemakers. Regarding the wines from the seminar, my favorite was the 2010 Syrah from Harrison Clarke Vineyards. It was still a bit young, but to my tastes a better balanced wine than any of the others, one that would have been great with a meal. 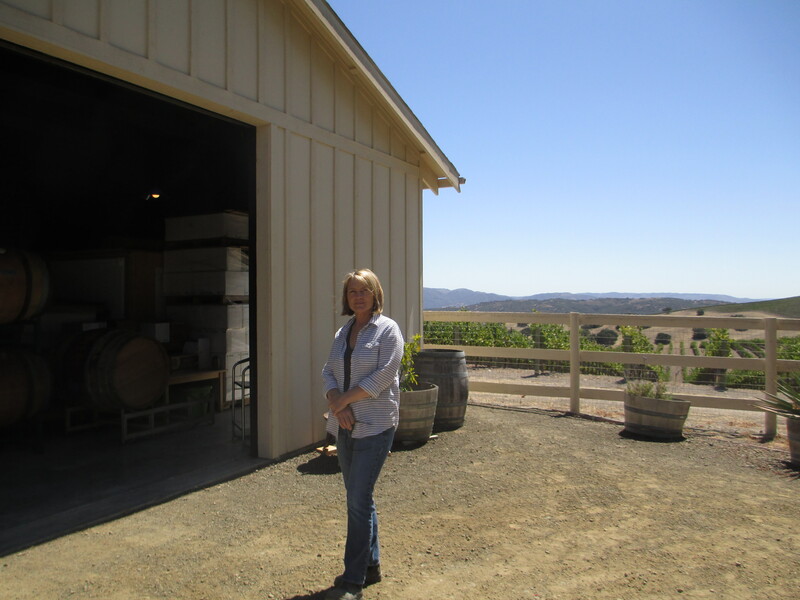 So when Lori and I went to Santa Ynez Valley in July, a visit Harrison Clarke was high on our list. Mid-July, and grapes were just starting to turn. The view down Ballard Canyon from Harrison Clarke. We started with a tour of their vineyards, about 12 acres currently planted, with Roger Harrison. An interesting walk, as we seemed to stop every 5 steps for another 2 minutes of discussion about one aspect or another about the vineyard: differences between the top of the hill and the bottom, differences between the edge of the vineyard near a tree and the middle of the vineyard, differences between newer and older vines, differences between the Syrah, Grenache and Mourvèdre that they have planted their. Roger is in the vineyards every day, and his love of the grapes was obvious. By the way, they’ve also got a great view from the vineyard down Ballard Canyon. Hilarie Clarke outside the Harrison Clarke winery. Now we have a dilemma: We want to open these wines, but we also want to let them age for a few years or more. It’s a tough problem, but somehow we’ll face up to the challenge. This entry was posted in food and wine, wine travels and tagged Ballard Canyon, GSM, Harrison Clarke Vineyards, Santa Ynez Valley, syrah on August 22, 2015 by vvblogman. Family legend has it that my parents used to trade Dodgers tickets for Qupé wine. According to Bob Lindquist, owner/winemaker of Qupé Winery, there was at least one discussion about that, but it never happened. So it’s just legend. We do know that my parents met Bob just after he started Qupé, while he was still working at another winery in the Santa Ynez Valley. Lori and I will take credit for that, since we were living in Santa Barbara at the time, and took my parents to that other winery. Shortly after, my job took us to the East Coast, but my parents kept up the relationship with Bob over the next 30+ years. 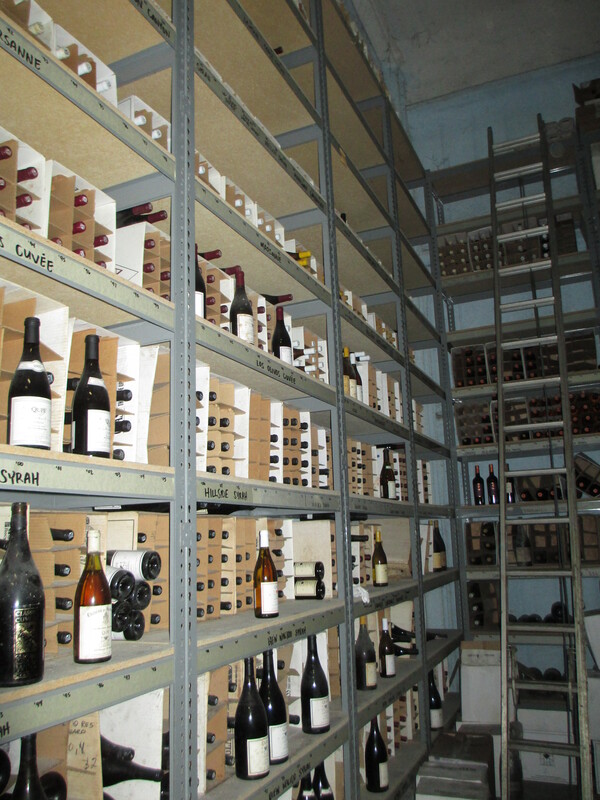 30+ years of wines in the Qupé library. In that 30+ year interval, all Bob did was to build Qupé into the leading producer of Syrah on the Central Coast of California, establish the Central Coast as a valid and valuable growing region for Rhône varietals and establish himself as one of the godfathers of those varietals in the state. That’s quite a résumé. 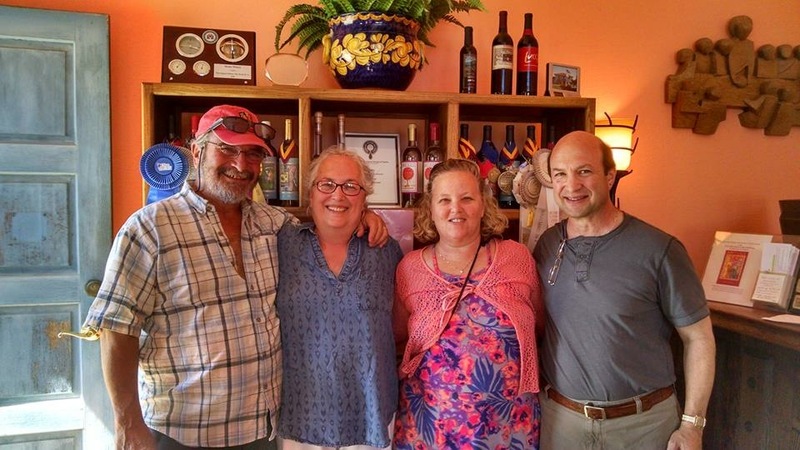 We reconnected with Bob at last year’s Wine Bloggers Conference, and he was our first call when we starting planning our trip to the Santa Ynez Valley this year. He didn’t have a lot of spare time, so he invited us to come to the winery and share their daily staff lunch. As befits a godfather, he made us an offer we couldn’t refuse: Come to the winery, located in the middle of the famed Bien Nacido Vineyard, taste Qupe and Au Bon Climat (ABC) wines (Au Bon Climat, headed by Santa Barbara Pinot Noir and Chardonnay pioneer Jim Clendenen, shares the winery with Qupe), and have lunch with Bob and the winery team. The lunch table at Qupé Winery. Since they had to work after lunch, and we had to drive, there were individual spit cups lined up on the table, as well as larger buckets. You’ll notice some white wines in the photo, but since this was really a red wine meal, I quickly skipped and spit through the whites to get to the reds. The Central Coast Syrah from Qupé is their largest production wine. Grapes from all three vineyards that they source from are included. This is a really nice Syrah, and at $20 per bottle it’s a great value. Verdad Wines is Louisa’s brand. She’s been in the wine business for decades herself, starting on the sales and marketing side of the business. The Tempranillo grapes come from a vineyard Louisa and Bob planted in the Edna Valley area, closer to San Luis Obispo than to Santa Ynez. The vineyard, the Sawyer Lindquist Vineyard, is farmed biodynamically. Tempranillo is an underappreciated varietal in California, with our abundance of great reds. But Tempranillo, cared for properly, can have complexity and subtlety and can age well. I’m not sure how the Verdad wines will age, as we were drinking fairly young wines, but this was among the best Tempranillo we’ve had from California. While we drank and enjoyed the 2012 Tempranillo with lunch, we bought a bottle of both the 2012 and 2011, so we could compare vintages at some point in the future. Armida is the winery our son, Brandon (Winemaker B), works for. We figured that a) bringing wine for lunch would be a good way to pay for lunch, and b) that bringing Zinfandel, the flagship grape for Armida, would be the way to go. Also, while there is Zinfandel grown in the Paso Robles area, there’s really none in Santa Barbara County, so Bob and team don’t get to try to many Zinfandels. The Il Campo was as expected, fruity and big, with the Petite Sirah boosting the body of the Zinfandel as it’s supposed to. The Parmelee-Hill was as we expected, but not what Bob expected. This vineyard is in Sonoma County, not too far from the Carneros region, and therefore is a much colder vineyard for Zinfandel than usual. And it produces a much more nuanced Zinfandel than most in California. Delicious. The Qupé 2011 Syrah Bien Nacido Vineyard, Highland Bench is the flagship wine for Qupé. Bob doesn’t make a huge amount of this wine; he can’t, there aren’t enough grapes in the block. But this wine gets special care, and it shows. This was Syrah with restraint, Syrah that was showing off its style on the catwalk and you wanted to see it from all angles, noticing the little touches and subtle flair in the execution. This was Syrah produced by an experienced hand, comfortable in his own skin, not trying to impress anyone but just making the wine he wants to make. This entry was posted in wine-food pairing and tagged Armida, Bien Nacido, Central Coast, Lindquist, Qupe, Santa Barbara County, syrah, Tempranillo, Verdad, zinfandel on August 8, 2015 by vvblogman. Why Italian varietals? Why Italian varietals in the Santa Ynez Valley, when other grapes grow so well? 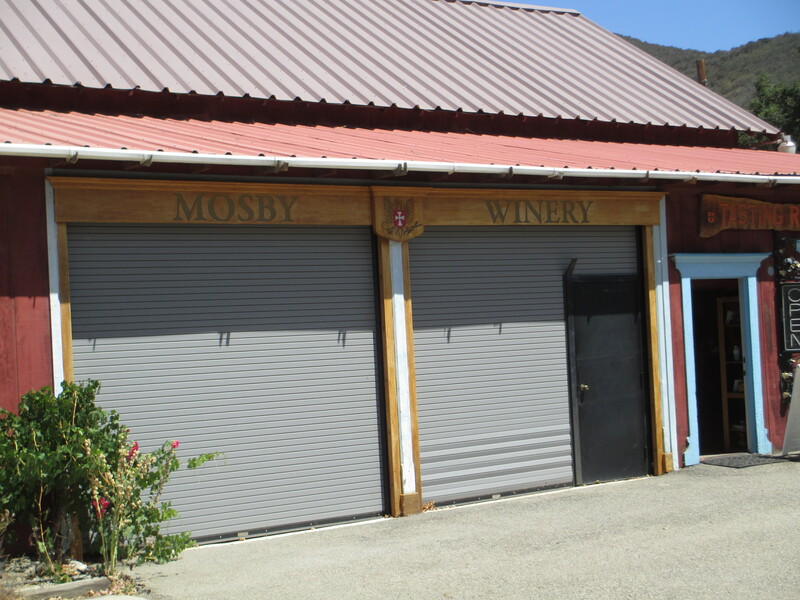 Sorry, I don’t know, but I do know that I enjoy going to Mosby Winery and tasting Bill Mosby’s Italian varietal wines, like Pinot Grigio, Cortese, Sangiovese, Nebbiolo, Lagrein and more. 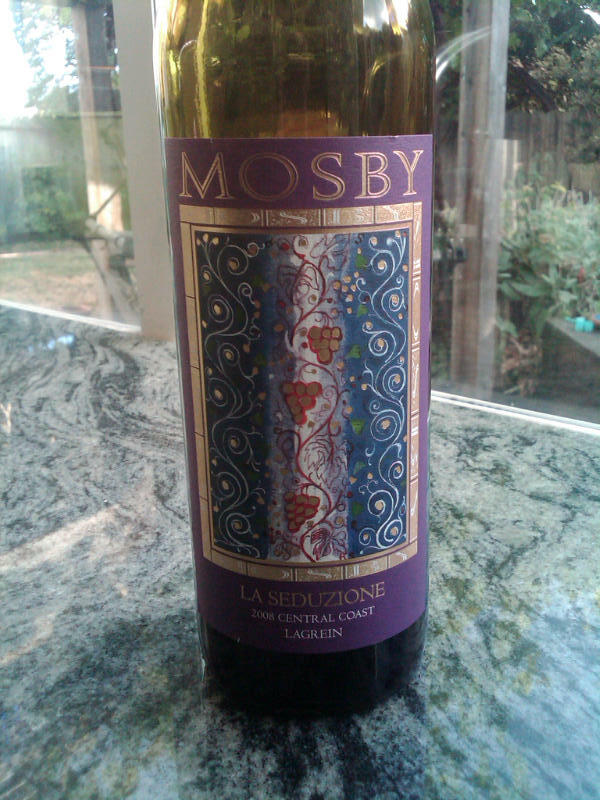 Most of the grapes are grown by Mosby, but a few wines are imported from Italy. The last time we visited Mosby was 2003, on a visit to Santa Barbara to celebrate my mother’s 70th birthday. There’s a photograph that was taken on that visit that is etched in my mind, of my father, myself and my two sons lined up at the Mosby tasting room bar. Unfortunately, I can’t find the photo, and I’m pretty sure it was taken with film and not on a digital camera. (Remember those days of old?) Probably in a box in the garage. On this visit my cousins met us at Mosby. 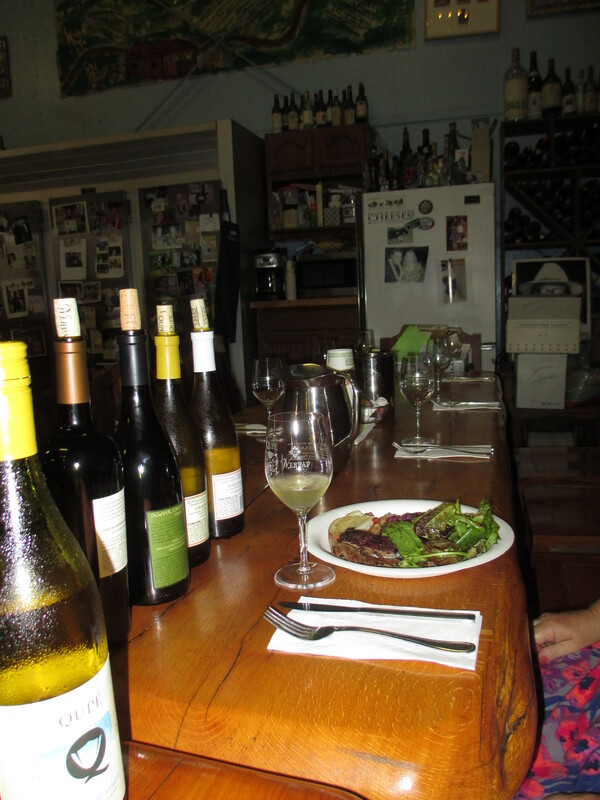 We went through a number of the Mosby wines, with Louise helping us through the tasting. We really enjoyed the Pinot Grigio and the Cortese of the whites, and all of the reds we tasted. Our favorite was the 2008 “La Seduzione”, made from Lagrein grapes. We bought a couple bottles of this, and opened one of these just the other night with a dinner of homemade falafel, tabbouleh (a salad of parsley, mint, bulgar, feta cheese, and whatever else you’d like) and halva for dessert. The La Seduzione was a great complement to the middle eastern flavors of the meal, with a relatively light body but nice fruit flavors. In addition to making excellent wine, the Mosby labels provide some of the best art in the wine world. Almost worth the visit just to see all the labels. Vineyards at Mosby. The flag on the right is a pre-revolution “Sons of Liberty” flag. 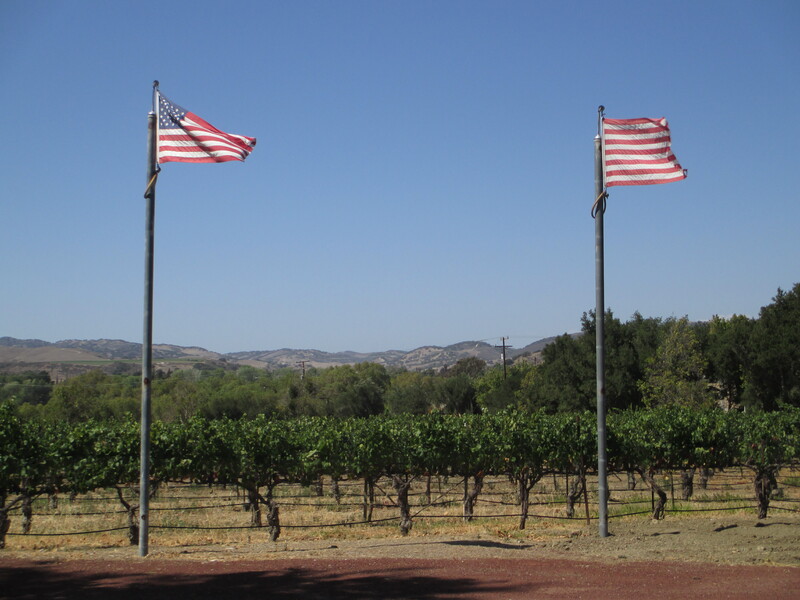 Mosby flies a U.S. flag at the winery and vineyards, and also a second flag. This second flag gets rotated every few weeks we were told. When we were there it was a variant of the Sons of Liberty flag, a pre-revolution flag of the U.S. This entry was posted in wine travels and tagged Italian varietals, Lagrein, Mosby Winery, Santa Ynez Valley on August 4, 2015 by vvblogman.